The Waltons Value Overlap Apex Bike Shed is a great value and functional product designed primarily for storage of adults or children's bicycles. It can also be used for general garden storage of gardening equipment. Accessibility is simple with ultra-wide double doors. The roof and floor are made from solid sheet material which gives it a rugged and robust internal finish. 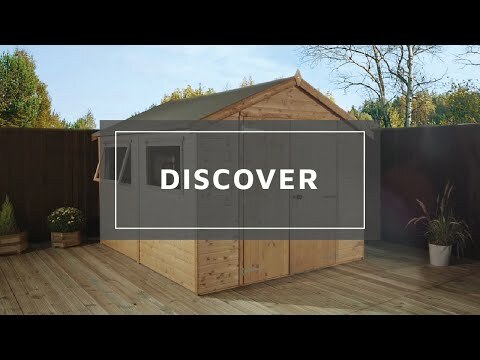 The Bike shed is constructed from overlap cladding which is secured to a sturdy 28mm x 28mm framing, creating a great value storage facility for your bike. We hope you enjoy using your bike shed for many seasons to come. Review:The shed and playhouse were delivered in record time. The instructions were well written. The quality of both is excellent, and the finished products are superb - the kids absolutely adore their playhouse and it's going to bring us years of joy! And finally - you absolutely cannot beat the prices. I am so pleased to know that you are happy with the quality of both your playhouse and overlap shed and that you were also very pleased with the quick delivery. Thank you again for your wonderful review. It is fantastic to know that you are happy with our excellent service staff and your overlap shed and your great review is really appreciated so thank you again!